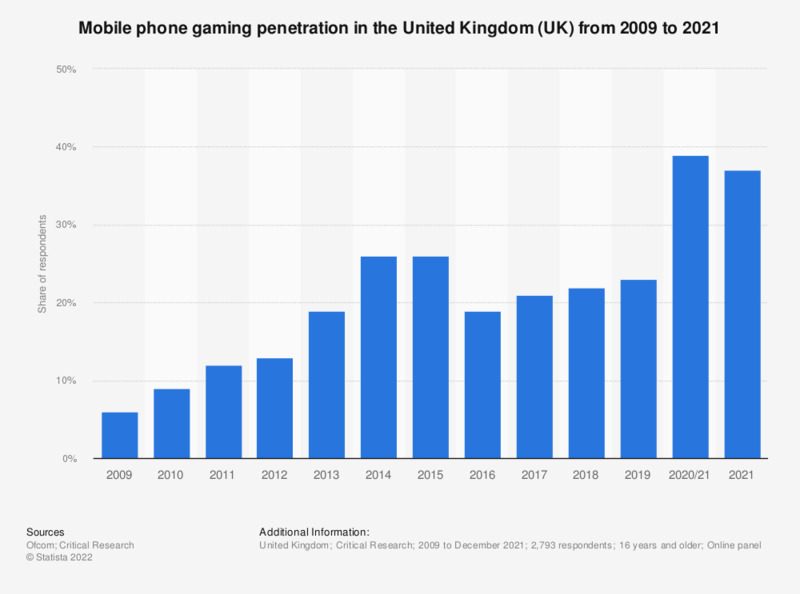 The timeline displays mobile gaming penetration in the United Kingdom (UK) from 2009 to 2017. The share of respondents who reported using mobile phones or smartphones for gaming increased from 6 percent in 2009 to 26 percent in 2015, followed by 7 percent decrease in 2016. The original survey question was: "Do you ever play games at home or elsewhere in any of these ways?" * n (2009) = 1,824; n (2010) = 2,117; n (2011) = 1,823; n (2012) = 1,805; n (2013) = 1,642; n (2014) = 1,890; n (2015) = 1,841; n (2016) = 1,846; n (2017) = 1,875. ** Most recent survey carried out in September and October 2017. In 2017, the survey was supplemented with data from the Technology Tracker survey in 2017, based on 2861 interviews with adults aged 16 and over in July and August 2017. Everything On "Online gaming in the United Kingdom (UK)" in One Document: Edited and Divided into Handy Chapters. Including Detailed References.